At the heart of the lovely historic market town of Hadleigh stands a group of ancient buildings with a truly remarkable history. 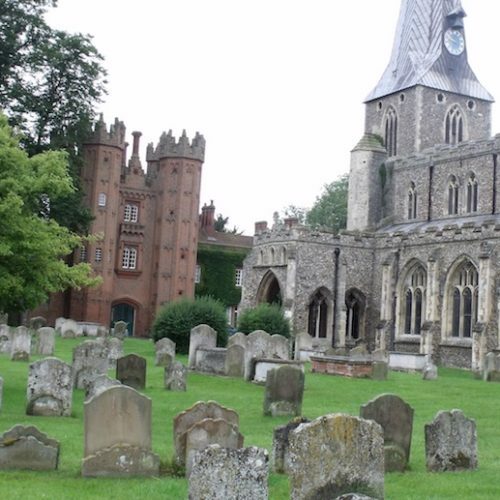 St Mary’s church is the place to start. You may think it’s the spire soaring up over 40 metres or the setting alongside the famous Deanery Tower and medieval Guildhall. 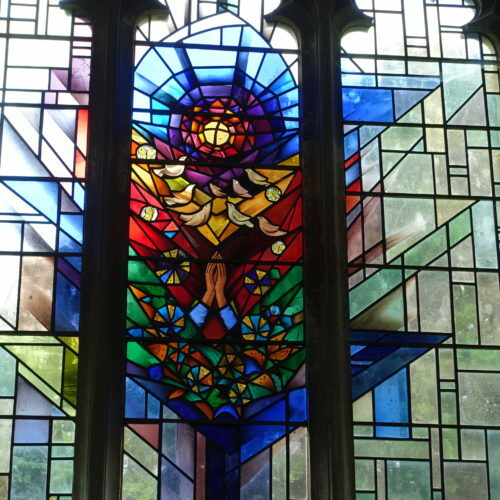 You may also think it is the vast nave with its inspirational lay-out, or the gorgeous modern window in the north aisle. 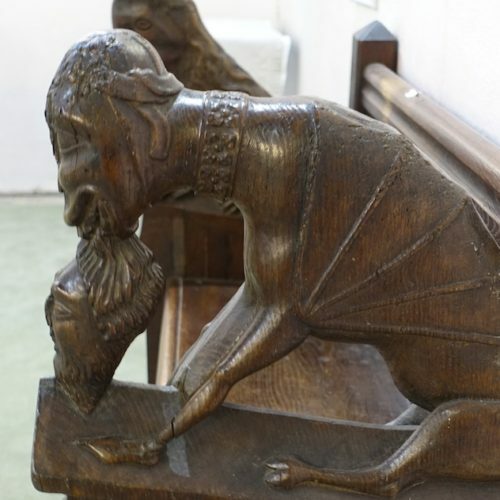 Dean of Bocking? Why the fancy title? 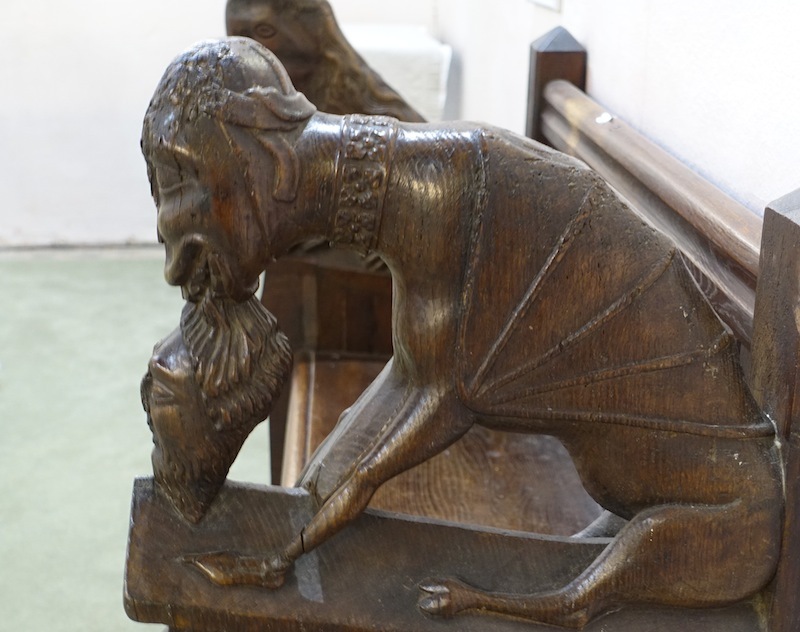 It all goes back to Saxon times but suffice to say that Bocking is a village in Essex, and the living is in the gift of the Archbishop of Canterbury. More Saxon links were uncovered when traces of a 9th century church were found south of the porch in 1829. 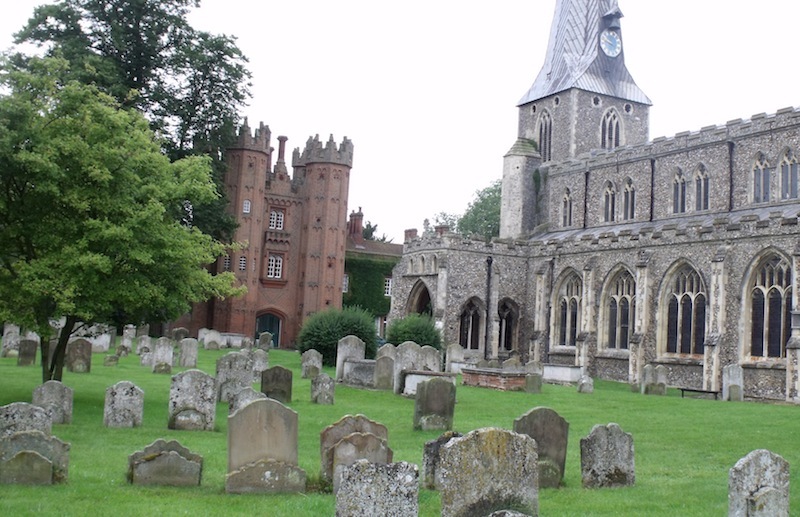 Hadleigh’s wealth came from wool cloth in the first half of the 15th century and St Mary’s was one of the first ‘wool’ churches to be rebuilt in that period. Ringers beer gotch that holds a formidable 32 pints! Brasses, stained glass, memorials and much else make this church a must for young and old explorers alike. 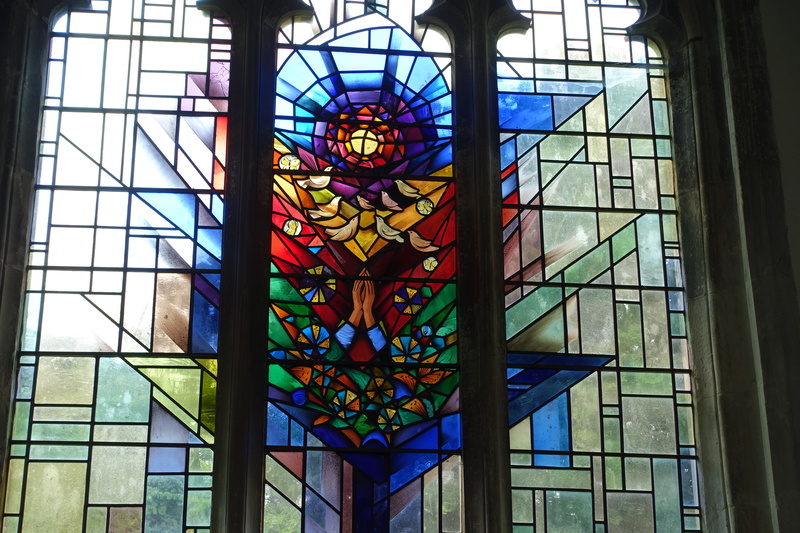 Find out about tours of the church and its surrounds and see what other visitors have said. 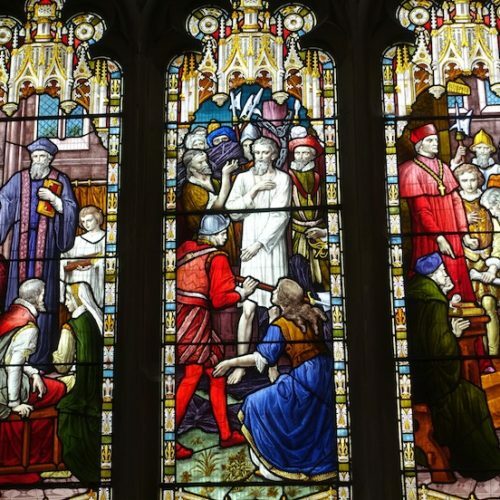 This church will never be mistaken for a museum. Walk in and you will find a space for all comers, from church crawlers and sanctuary seekers to toddlers and lively teenagers. 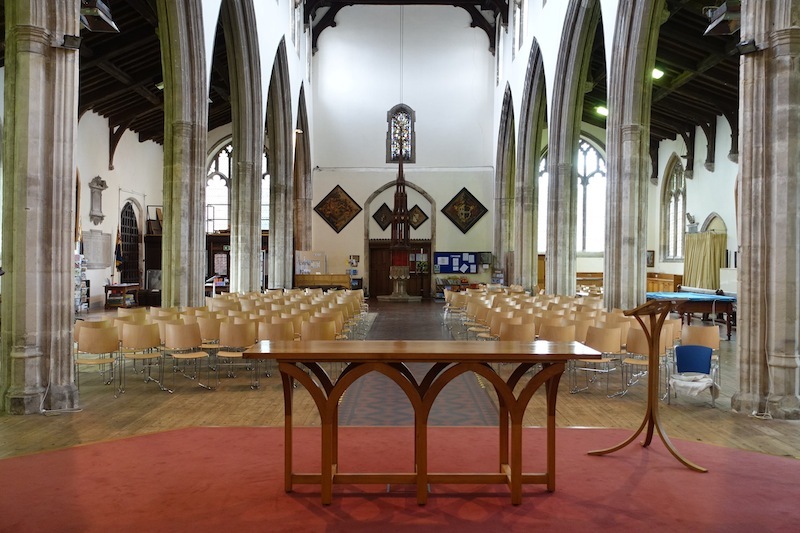 Heavy Victorian pews have been replaced by stylish wooden chairs, transforming the nave into a space that’s aesthetically beautiful and flexible enough to accommodate everyone’s needs. Check out St Mary’s website to find out more about what happens here. So what’s this about the Porch? The Porch Project is well known throughout Suffolk and beyond for welcoming young people into the building when they had nowhere else to go back in 2009. Today over 300 local young people aged 11-20 can drop in for food and friendship, use a state-of-the-art media and computer suite, and benefit from counselling, mentoring and other support services. It all costs money though! Plenty of those. Hadleigh embraced the Reformation and pioneered the use of English in the Mass. Sadly the Rector Rowland Taylor, chaplain to Archbishop Cranmer, suffered for his daring stance when, under Catholic Queen Mary, he was burned to death on Aldham Common in 1555. The Common was enclosed in 1729 with the income to be used for the ‘poor of Hadleigh’ and today the Aldham Common Charity administers the land with money raised going to cases of hardship within the Parish. 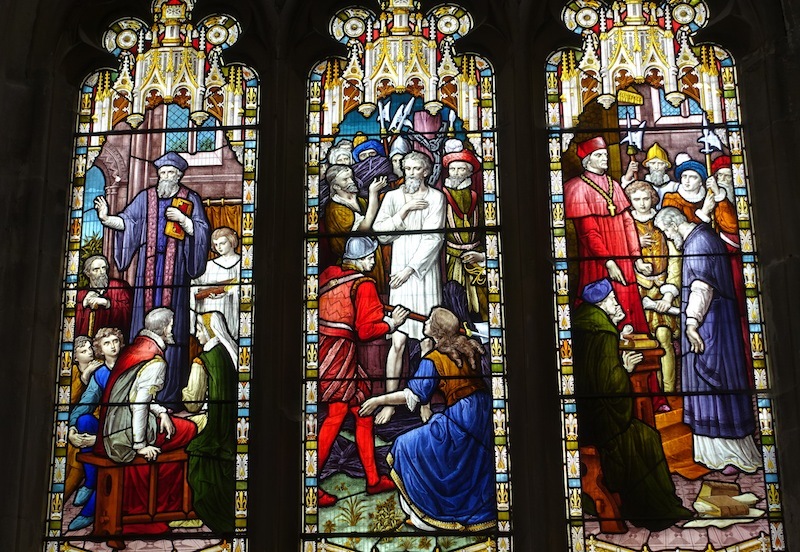 Scenes of Rowland Taylor’s preaching, trial and martyrdom feature in a Victorian window in the south chapel at St Mary’s. Over in the north chapel, there’s a plaque to Dean Hugh Rose who convened the famous Hadleigh Conference in the Deanery Tower that spearheaded the Catholic revival in the Church of England known as the Oxford Movement. 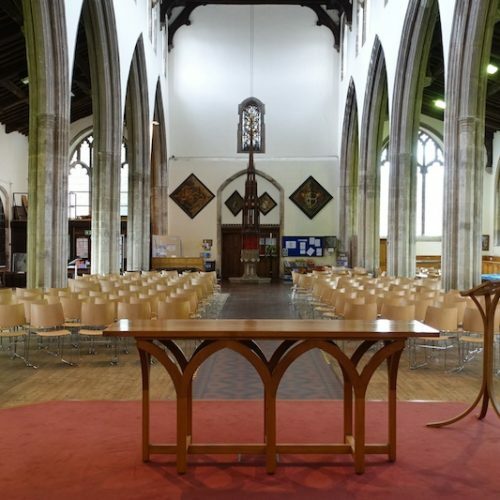 As you leave the magnificent St Mary’s, why not think about a donation to the Porch Project as a thank you to the volunteers who keep the church open for all to enjoy and support young people in so many imaginative ways? If you’re planning lunch out or a decent coffee and cake, you’re spoilt for choice in this busy market town. You’re not far from the other wonderful wool towns, the gorgeous villages of south Suffolk such as neighbouring Kersey and, in the other direction, Dedham Vale and Constable Country. If you want to explore the beautiful countryside nearby, visit the Discover Suffolk website and key in Hadleigh for a great choice of walks.